This is a veganised version of the traditional Middle Eastern breakfast using scrambled tofu! 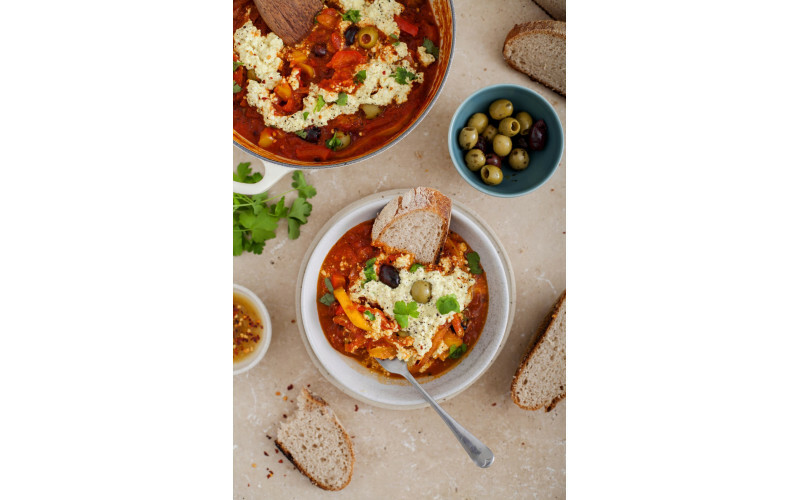 Not only is this dish full of flavour and goodness with the aromatic tomatoes and sautéed peppers, it’s easy to make and is the perfect addition to any weekend brunch. Serve with warm sourdough to soak up the sauce, and chilli ‘oil’ made with cacao butter if you want to spice things up! Put the peppers, onion, garlic, lemon juice and spices into a large casserole dish and sauté over a medium heat. Once the peppers have begun to soften, add in the tomato puree, tinned tomatoes and olives. Bring to the boil then simmer for 30 minutes. While the shakshuka is simmering, add the silken tofu, black salt and pepper to a frying pan. Using a fork mash the tofu, and cook over a medium to high heat for a couple of minutes. Pour the scrambled tofu over the top of the shakshuka. Sprinkle over some parsley, chilli flakes and serve with sourdough and chilli oil.